The Petrified Forest is playing at the wonderful Stanford Theatre (1925 restored cinema showing Hollywood movies). In todays Guardian – an evocative “Country Diary” set in Borth, near Aberystwyth, west Wales, where we used to live. 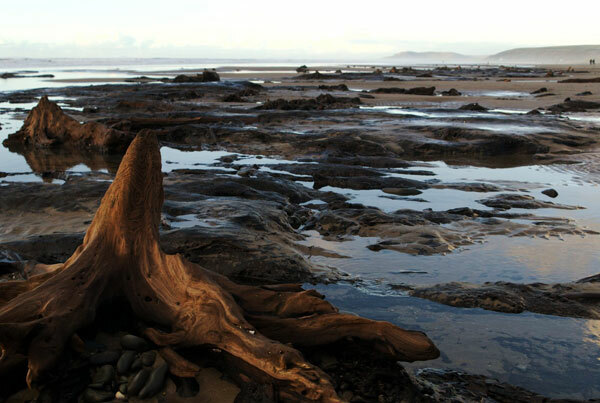 Another petrified forest on the coast and taking us back to the days of the Welsh epic sagas. After the long winter, with its numbing cold and sustained snowfall, few things raise the spirits as much as walking under a deep blue sky with the afternoon sun warming your back. Add to this a long stretch of empty beach and the scope for improvement becomes vanishingly small. My visit to Borth was timed to coincide with a spring tide, whose dramatic range exposes at low water much that is usually covered by a confusion of surf. Winter storms scour the beach dramatically, and a visit in early spring often yields previously hidden elements – including new areas of the ancient sunken forest for which the beach is well-known. The especially low tide revealed a part of the forest I hadn’t seen before. A dozen feet or so below the peak high-water mark, stumps of trees and jumbled arrays of prostrate trunks stood out from the scalloped ripples of the beach. Beyond them I could see tangled shallow root systems set in a glossy, eroded matrix of clay and woody peat. Some newly exposed trees had surprisingly well-preserved bark still in place, and several were immediately recognisable as birch. Dated at around 5,000 years old, these trees appear to have lost a battle with rising sea levels after the last ice age. Welsh legend carries intriguing tales of the lost land of Cantre’r Gwaelod (the Lowland Hundred), a fruitful tract beyond the present shoreline whose sea defences were inundated through either poor maintenance or drunken error. Could this be a folk memory carried by word of mouth for thousands of years, or is it a later tale devised to account for the same evidence of change visible today? Opinions appear divided, but as I watched the incoming tide gently moving the individual sand grains of the beach it was clear that change is the natural state of the coastline – whether we like it or not.